Lynn Dean Vinke was born August 3, 1971, to Joyce (Otto) and Gary Vinke in Manning, Iowa. Lynn attended Concern Inc. in Harlan, Iowa until the age of nine. Then he was able to stay at home with his parents. As his health worsened he moved to Faith, Hope and Charity in Storm Lake, Iowa and stayed there until he was 18. 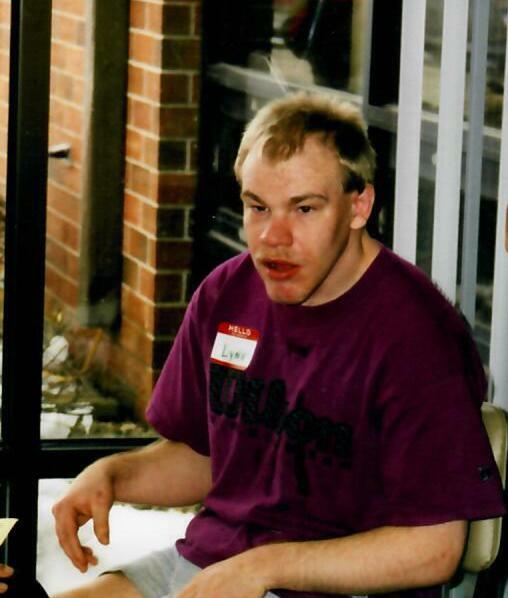 IN March of 1990 he became a resident of Opportunity Living in lake City, Iowa. Lynn was baptized at the Zion Lutheran Church in Manning Iowa. He enjoyed the many pony cart rides that his brothers gave him when he was little. He also enjoyed being around family and the many friends he made at Opportunity Living. He really enjoyed it when the other residents at Opportunity Living were getting in trouble. Lynn died on Sunday, April 7, 2019, at the Stewart Memorial Community Hospital in Lake City, Iowa at the age of 47 years, eight months, and four days. Lynn was preceded in death by his grandparents. He is survived by his parents, Joyce and Gary Vinke of Pisgah, Iowa; three brothers, Brian Vinke and his wife Kerry of Ute, Iowa, Craig Vinke and his wife Susan of Glenwood, Iowa, and Todd Vinke of Milford, Iowa. He is also survived by several aunts, uncles, nieces and nephews and other relatives and friends.